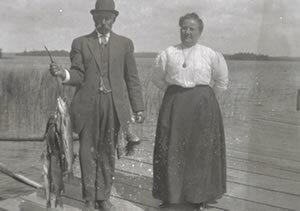 John and Matildia Takala were some of the first homesteaders on Pelican Lake. 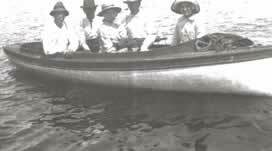 1903 – John came by canoe from Tower across Lake Vermilion, up the Vermilion River to the Pelican River, and on to Pelican Lake. Later that year, he and his bride, Matilda, boarded a train in Virginia and went to Ashawa (now Cook). From Cook, John and Matildia walked 24 miles to Pelican Lake. 1904 – The Takala’s moved to Pelican Lake with their 3 young children. 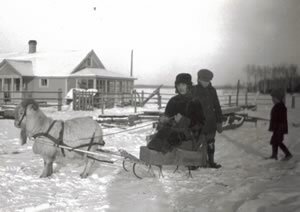 1905+-Two children were later born at their new homestead. John and Matildia worked hard raising a family, farming, building roads, and logging. They cleared about a hundred acres around this area, raised hay, potatoes, & corn. The parents grew older. 192? – John Alfred, a graduate of Coyne Electrical School in Chicago, quit his job in a mine to come back to the farm to help take care of his ailing parents. He was the oldest of the five children. 1986 – At the age of 86, John married for the first time. His bride’s name was Henrietta. 1987 – John sold “Lakeside Farm Resort” on a contract for deed and moved to Phoenix, AZ with his new wife Henrietta. 1988 – A year after selling the resort John took it back. The place was poorly managed and had become run down. John was now getting very old. He needed assistance. Grover “Grubby” Gillespie, a young neighbor and friend of John’s, who had helped him over the years, was called and asked to manage and fix up the resort. Grubby & Diana took on his new responsibilities in 1988. 1989 – Grubby and Diana went through each cabin bringing them up to code. They were gutted, re-roofed, porches were added. A new septic system was installed, wiring improved and cabin #9 was brought down from its original site, near the old homestead, to where it is currently located to serve as a lodge. 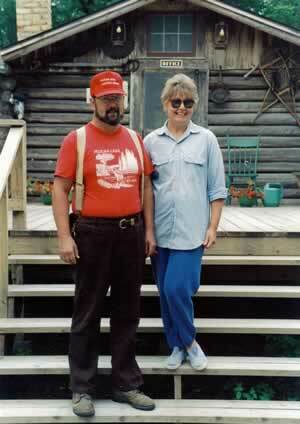 Grubby and his wife Diana lived in the Rocky Point cabin during the summers. 1991 – John Takala died. 1993 – The resort was sold to J & J Land Co. in 1993-94. It sat empty for a few years. Grubby and Diana still caretook at times. 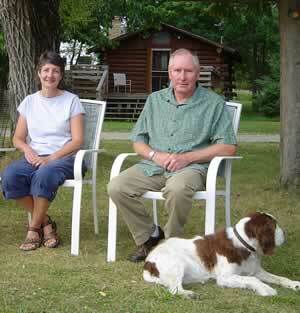 1996 – Rob and Joanne Kemkes purchased “Lakeside Resort” and renamed it “Grey Wolf Lodge”. Like John, and Grubby and Diana before them, Rob and Jo continued to make improvements to the place. 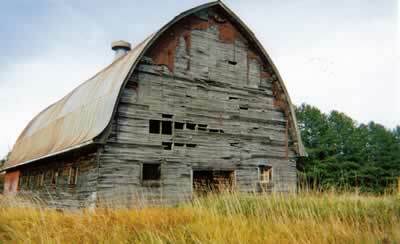 Their largest contribution was the renovation of the “old barn” built in 1939. Today, that barn serves as both our lodge and home. 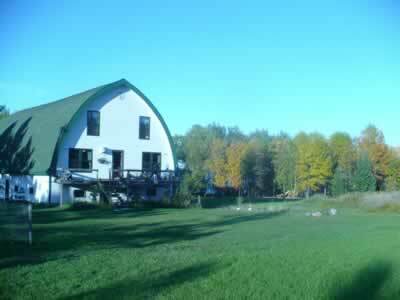 The barn was moved from its original site, on top of the hill across the road, to where it sits today. 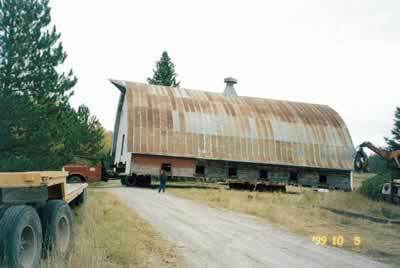 2000 – Original 1939 Takala barn moved to its current location. 2008 – John Metsa, Carol Carlson, and Jacob Metsa purchase “Grey Wolf Lodge”. They added a mini-golf course, sauna/spa building, one-hole golf course, “Big Toy” play ground, and are improving the grounds. We are sure John is proud of all of the parties that followed his lead. The resort is as beautiful as ever. Thank you Mr. Takala.